Educators in in Arizona and Oklahoma, two of the worst paid states for teachers in the country, are demanding salary hikes. The West Virginia teachers strike that ended last week may have ignited a national labor movement, as teachers in Kentucky, Arizona and Oklahoma are making their frustration over pay and benefits known and sharing demands with their state legislators. The movement in West Virginia not only won teachers there the 5 percent pay hike they requested but also served as a potential template for those in states where teacher salaries rank among the lowest in the nation. And now teachers appear ready to storm out of classrooms and take to the streets, if necessary. “I haven’t seen this much excitement in the labor movement for a strike for years and years,” said Joe Burns, the author of two books about union strikes. “There’s a lot of energy, and a lot of national attention being paid to it,” said Burns, who is also the director of bargaining for the Association of Flight Attendants. Last week, Kentucky teachers came out in force to protest proposed cuts to their retirement benefits. And in Arizona and Oklahoma, two of the worst-paying states for teachers in the country, educators are demanding salary hikes. All three appear to be taking cues from West Virginia. Joe Thomas, president of the Arizona Education Association and a social studies teacher, recently talked tactics with Dale Lee, his successful West Virginia counterpart. With Lee’s encouragement, Thomas and his members adopted “small symbolic steps”: having teachers wear red, planning walk-ins and walkouts — all while they mull whether to strike. A Facebook group created to organize educators has already garnered tens of thousands of likes. Though unions in Arizona — a right to work state — don't have the same power as those in West Virginia, Thomas said teachers are upset and are ready to fight for up to a 10 percent raise and class size reductions. The consensus is that something will have to be done, as the state faces a serious teacher shortage. “We have kids in schools where the teacher often doesn’t come back after a few weeks because they got a better job at Nordstrom,” said Dawn Penich-Thacker, an English teacher at Arizona State University and member of Save Our Schools Arizona. Oklahoma teachers, meanwhile, are organizing with state employees. They are all considering a possible strike if they and their support staff don’t receive pay raises and schools’ operational budgets aren’t increased. Organizers say more money is necessary if the education profession is to survive. 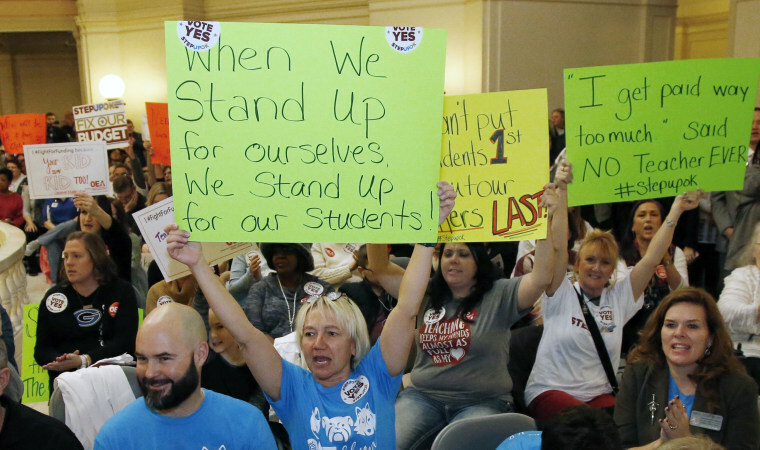 "Our members are emboldened by what happened in West Virginia and we’re receiving a lot of support from our brother and sister teachers there," said Doug Folks, a spokesman for the Oklahoma Education Association. Currently 95 school districts in Oklahoma have shortened the school week to four days because the districts do not have enough funding to keep the schools operating. Meanwhile, since 2008, Oklahoma has lost 2,000 teachers and gained approximately 50,000 students. Class sizes have continued to increase ever since. Teachers told the state legislature that they have until April 1 to propose a fix to the education system. Oklahoma currently has some of the lowest paid teachers in the nation, according to the National Education Association. Mississippi and South Dakota are the only states with worse teacher salaries. The momentum in teacher labor movements is growing in other states as well. A union representative in Idaho told NBC News that union officials had noted an uptick in interest in the wake of the West Virginia teacher’s strike. Educators in Colorado, which the NEA ranks 46th in the country for teacher pay, are beginning to stir as well. “What happened in West Virginia absolutely has inspired our members — and teachers in general in Colorado — to start to advocate and think about what’s best for our kids," said Sarah Hamilton, executive director of the American Federation of Teachers in Colorado.